Здесь вы можете прочитать биографию Джорджа Буша младшего на английском языке. 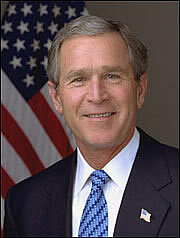 George W. Bush (06.07.1946) - American president. President Bush was born on July 6, 1946, in New Haven, Connecticut, and grew up in Midland and Houston, Texas. He received a bachelor's degree in history from Yale University in 1968, and then served as an F-102 fighter pilot in the Texas Air National Guard. President Bush received a Master of Business Administration from Harvard Business School in 1975. Following graduation, he moved back to Midland and began a career in the energy business. After working on his father's successful 1988 Presidential campaign, President Bush assembled the group of partners who purchased the Texas Rangers baseball franchise in 1989. On November 8, 1994, President Bush was elected Governor of Texas. He became the first Governor in Texas history to be elected to consecutive 4-year terms when he was re-elected on November 3, 1998. Since becoming President of the United States in 2001, President Bush has worked with the Congress to create an ownership society and build a future of security, prosperity, and opportunity for all Americans. He signed into law tax relief that helps workers keep more of their hard-earned money, as well as the most comprehensive education reforms in a generation, the No Child Left Behind Act of 2001. This legislation is ushering in a new era of accountability, flexibility, local control, and more choices for parents, affirming our Nation's fundamental belief in the promise of every child. President Bush has also worked to improve healthcare and modernize Medicare, providing the first-ever prescription drug benefit for seniors; increase homeownership, especially among minorities; conserve our environment; and increase military strength, pay, and benefits. Because President Bush believes the strength of America lies in the hearts and souls of our citizens, he has supported programs that encourage individuals to help their neighbors in need. President Bush is married to Laura Welch Bush, a former teacher and librarian, and they have twin daughters, Barbara and Jenna.